The LifeSpan TR1200-DT5 Treadmill Desk is an adjustable treadmill and desk combo that allows the user to walk and work at the same time. Its 46.5″ wide x 31″ deep desktop work surface gives the exerciser plenty of room to work with a laptop, a tablet, a magazine, or another work item; the tabletop is conveniently placed over the walking surface and is adjustable with a height range of 16 inches. The belt is also larger than those of some models, boasting a 20″ x 56″ walking surface that can hold exercisers that weigh up to 300 pounds. The 2.25 HP DC drive motor can power this treadmill for up to 6 hours a day at speeds ranging from .4 to 4 mph. 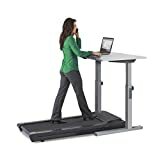 Released on November 28, 2011, this treadmill and desk combo is currently available on Amazon.com for $1,499 plus free shipping. The 46.5″ x 31″ work surface provides plenty of room for various work items. The 20″ x 56″ belt can hold users that weigh up to 300 pounds. The speed level can be increased from .4 mph to 4 mph. The treadmill can operate for up to 6 hours per day. The tabletop can be adjusted in a 16-inch range. The large work surface (46.5″ x 31″) provides exercisers with enough room to use multiple work items at one time while walking. The belt is a larger size than some treadmills at 20 inches by 56 inches, so it can accommodate people with larger strides. Users can walk at speeds varying from .4 mph to 4 mph. The 6-hour operation time ensures that exercisers can work out for most of the work day if they so desire. The 16-inch range of the tabletop means that exercisers can adjust the working surface to accommodate a wide range of heights. The 2.25 HP DC drive motor provides a smooth and quiet motion that allows exercisers to walk and work at the same time. Intelli-Guard technology automatically turns off the treadmill if the user’s foot does not land on it within 20 seconds of the last step, increasing user safety and keeps and displays a step count that is more accurate than the average pedometer. Treadmill and table combo can comfortably accommodate users who are between 4”10’ and 6”8’ tall, allowing for a variety of users. Ergonomic armrests are foam-injected and help exercisers avoid serious concerns like wrist strain and carpal tunnel syndrome. Step-up rate of 5 inches is low enough to make getting on and off the treadmill easy. LED digital display is easy to read and displays such data points as speed, walking time, number of steps taken, and burned calories. The cable slot and cable tray built into the desktop help keep AC cords out of the way and untangled. Frame has a lifetime warranty; the motor has a 3-year warranty; the other parts have a 2-year warranty; and the labor has a 1-year warranty. Shock-absorbing deck suspension creates a smooth ride and is easier on exercisers’ joints. Bluetooth technology allows the user to connect to a computer and automatically track the progress of those willing to sign up for a $69 lifetime membership with the LifeSpan Fitness Club. This treadmill and desk combo is heavy—in fact, it weighs in at only 2 pounds under 200 pounds. Moving so much weight might be difficult for even 2 or 3 strong people. While this treadmill and desk combo is not the most expensive treadmill set of its kind, it is still quite expensive—especially in terms of treadmills. People on a budget may need to look for a slightly cheaper treadmill desk model. Since the speed only goes up to 4 mph, exercisers will not get in a fast run on this treadmill; users who are looking for a treadmill for running or jogging should look elsewhere. Some users have struggled with synchronizing walking and working (although other users have reported figuring out how to do both things by practice). Adjusting the height of the desktop area can be difficult; two people will likely have to make these adjustments. The Bluetooth tracking technology has malfunctioned for some users and has failed to track progress regularly, handle multiple sessions in one day, etc. 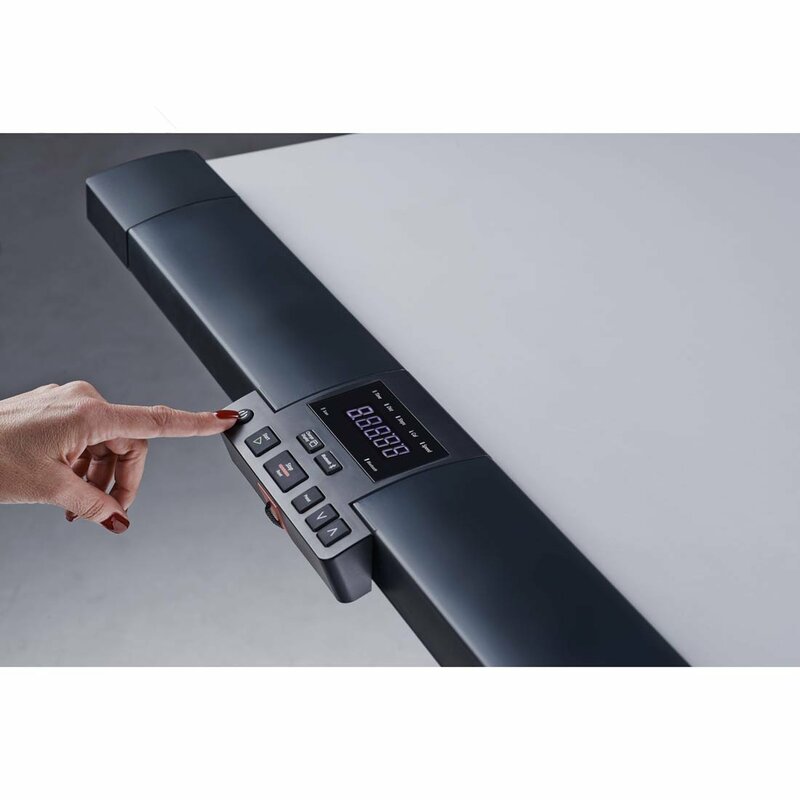 That the LifeSpan TR1200-DT5 Treadmill Desk is heavy is no surprise considering that it is a high-quality treadmill and a wooden desk mounted on steel arms. Heaviness is the price of quality—as is the literal price. Speed should not be an issue since most people would not be able to get work done while waking faster than 4 mph anyway. Many studies suggest that sitting for long hours every day is bad for the health, so purchasing a treadmill and desk combo that allows a person to walk for at least part of the day may pay dividends down the road. Exercisers who are on too much of a budget to afford this treadmill may want to consider purchasing the Exerpeutic 2000 WorkFit High Capacity Desk Station Treadmill. While this treadmill and desk combo has issues relating to height, desktop position, and functionality, it is also half the price of the LifeSpan TR1200-DT5. It is also smaller and more portable—but with the same maximum mph capabilities plus a 15% incline.